On June 13th, Christie Golden had a public appearance and signing schedule at the Book Revue in Huntington, New York—where she also read a few pages from the World of Warcraft: Arthas, Rise of the Lich King hardcover book. This book made the New York Times Bestseller Hardcover List twice in a row barely four days after its official launch into bookstores. 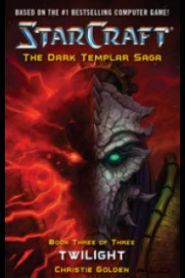 I had the opportunity to ask Christie Golden what her feelings were after hearing how successful the sales of her ARTHAS novel was, and interviewed her to ask questions about Starcraft: The Dark Templar, Twilight. Most of the questions were submitted by the lore community. Christie Golden answered all of them. I read this book, and I can tell you it is amazing. Many things are revealed. There are a few cliffhangers that will be answered in Starcraft II eventually. 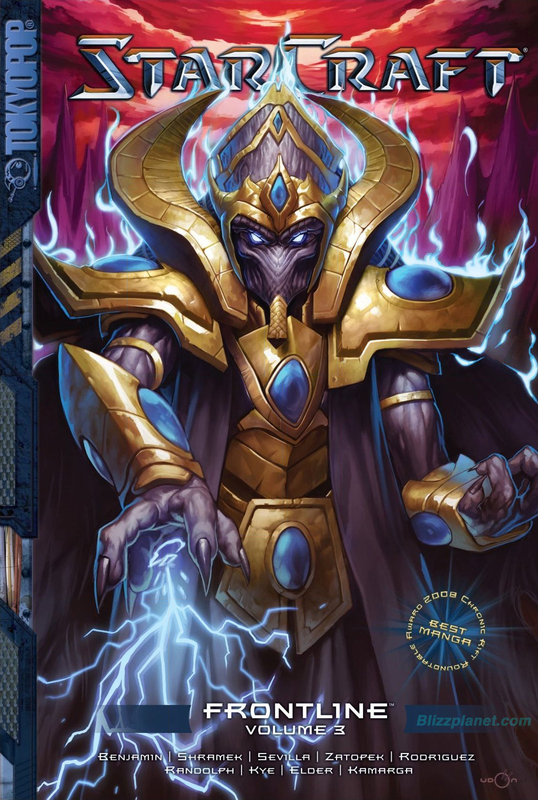 And you will learn the shocking truth of the Xel’Naga and the purpose of their experiement with the Protoss and the Zerg. There are many twists awaiting you. Your crave for the Starcraft II single player will be increased a hundredfold. Watch our video interview with Christie Golden for some teasers. Tokyopop provided us a copy of the StarCraft Frontline Vol. 3 to review. It will be officially on a bookstore near you, or online on Tuesday, July 14th. This volume contains four stories: War-Torn, Do no Harm, Last Call and Twilight Archon. I really dig and enjoy War-Torn by Paul Benjamin and Dave Shramek. Not only it has a very good and immersive dialogue going on, the artwork is one you will like right away. Hector Sevilla should be brought often to spice up the series. In War-Torn, for those who have been following the storyline of Corbin Phash’s telepath son, the story sets some cliffhangers that might or not be explored in the StarCraft II episodes. A wrangler is sent by the Dominion to track the telepath boy. He uses murderous means to find the boy at all costs. Those who aren’t acquainted with what a wrangler is, they were introduced in StarCraft: Ghost Nova by Keith R.A. DeCandido back on 2006. A wrangler has a Psi-Index (PI) 3.5. They aren’t telepaths, but are psi-sensitive. In short, they can sense when a telepath is nearby by the headache they get. They are sent by the Dominion to track and hunt down telepaths, specially children, to be trained in the Ghost Program Academy. The Dominion Senator is hiding in the Umojan Protectorate, and promises he will not rest until he recovers his boy and spread in the media the truth about the Ghost Program. It seems Emperor Arcturus Mengsk has turned the Ghost Program into something more evil than it used to be with the Confederates. I recommend all StarCraft fans to read StarCraft: Frontline Vol. 3. It has some interesting stories there that makes you wonder exactly what Blizzard Entertainment is going to spotlight in the single player episodes. Read more of this review after the break. This wrangler has Zerglings at his disposition. They have been lobotomized to break their link with Kerrigan. Yup, exactly what you are thinking. This wrangler uses them as bloodhounds to search for the telepath boy. The Zerglings have a tech-collar to control them; and if they go nasty against his master, the collars have explosives for auto-destruction. Basically they set Zerg loose upon these telepath boys to cause mass hysteria among the population. This way the people think the untrained telepaths are dangerous for civilization because they attract zerg like magnets. The people then cooperate with the Dominion authorities and sell out volunteerly any info they may have about the kids. Any zerg incursion must look like it has been a natural thing, and no traces that they have been deployed by the Dominion must come to the public nor the media networks. A very dirty tactics there in the Dominion. Makes you think the Confederates were saints in comparison. The conclusion of War-Torn reveals what I reported recently. The Tokyopop editor confirmed a few days ago that the telepath kid named Colin Phash will end up in the upcoming StarCraft Ghost Academy Vol. 1 by Keith R.A. DeCandido (on sale Jan 5, 2010). The second story in StarCraft: Frontline Vol. 3 by Josh Elder left me in shock. The Dominion scientists have secretly captured Protoss to conduct experiments for a whole year. They are known as Project Gestalt. They created a prototype codenamed Gestalt Zero. 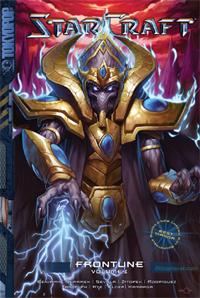 It is a … protoss-human hybrid created by the Dominion. He has a Ghost suit partially similar to the Ghost shown in the BlizzCon 2009 logo. His face looks semi-human with a nose, and mouthless like a Protoss. He is a Psi-Index 7.5 and has double the combat effectiveness of a normal Ghost. It has Zealot psi-blades and equipped with guns. The Dominion wants to mass-produce this prototype for their war against the Protoss and the Zerg. You really want to read this story completely. The next story is titled Last Call. It is about a singer named Starry, who worked on Tarsonis city. Her left cheek is disfigured. She was a survivor of the Zerg invasion on Tarsonis. A Zerg Queen attacked her, and now she lives in shame for her scar, and the nightmares of that encounter have continued on and on, tormenting her. She moved on and now works at a Sour Moon Bar in the Meteor Station. Without spoiling too much, we get to see two diplomats arranging a deal. The Kel-Morian have found during their digging a Xel’Naga artifact. The Dominion wishes to buy it from them. We get to see the tension between both factions, and the thin threshold holding them from diplomatic catastrophe. If anything, this story will show us the next evolution of the Zerg. Let’s leave it at this: the Terran Dominion’s scanners can’t detect parasites anymore. Kerrigan may have unwilling eyes and ears on high spheres of the Dominion Command. Trust no one. The last story is titled Twilight Archon. We get to see the final moments of the invasion of Aiur. A female Protoss Templar sacrifices and invokes a mother of a Psi Storm that decimated many Zerg before losing consciousness. She awakes, and is welcomed back by a Dark Templar. He informs her she’s been out unconscious since her brave display in Aiur. The Aiur Protoss are now in Shakuras, as guests of the Dark Templar. She can’t bear the silence, and the emptiness. He informs her, a Hydra cut her appendages. She is no longer in the Khala, and can’t hear her brothers’ psi-union anymore. She fears her students won’t trust her anymore. She is now unwillingly a dark templar in a way without her appendages. Without going too deep into the story, you will see the origin of the first Twilight Archon, and how they were able to merge this way. I really liked the artwork on this story. It would be hard to compare or decide on which is best from all four stories. Actually, Hector Sevilla rocks, but I liked pencils and inks by Noel Rodriguez. To be sincere, I have never collected manga, nor like the style. However, I do enjoy the StarCraft: Frontline series. I purchased volume 1 and 2 last month. All I got to say to Tokyopop is: “Please, keep them rolling.” I would like this series to be ongoing beyond the three-years deal. The stories are thrilling, and you will quickly grow addicted to this manga. If at least Tokyopop could publish these monthly as an ongoing series. It is definitely a worth read. It expands the Starcraft universe and your perception of it. I would like to see some of this stories branch out into some of the Starcraft II single player missions. 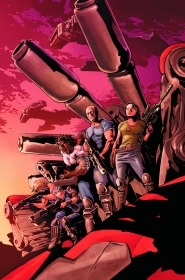 We had the opportunity to ask questions to Simon Furman, writer of StarCraft # 1—the ongoing Wildstorm comic book, to discuss details of the first arc. He is widely known for his work on The Transformers series. We wanted to find out how his experience benefits the StarCraft series to spice up the conspiracies and tone of the Koprulu sector, specially when the comic book is based in the time-frame of the upcoming StarCraft II single player storyline. How does your experience with The Transformers translate into your new role in the StarCraft comic book? And what’s your feeling on taking this project? The StarCraft # 1 comic book by Wildstorm Comics and DC Comics will make its official launch on May 27th at all newsstands nationwide. This is one of the most expected comic book titles based in Blizzard Entertainment’s StarCraft Universe. The comic book heralds the release of the RTS sequel StarCraft II and will give us a glimpse into its single player storyline. We approached Ben Abernathy (Wildstorm Starcraft Editor) to find out further details of this comic book beyond the solicitations to increase our expectations and crave for this new ongoing series. What timeframe does the comic take place in? Ben: Our book takes place in 2552. What can you tell us about the main characters? And will known heroes such as Jim Raynor, Zeratul, Matt Horner, Tychus Findlay appear in the comic book?